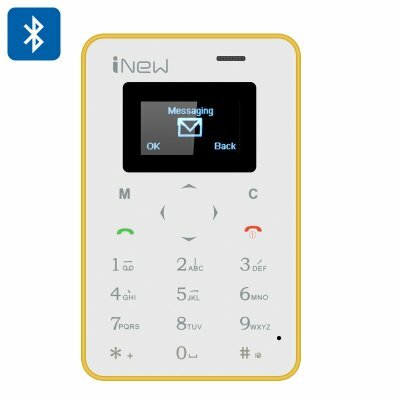 Successfully Added iNew Mini 1 Credit Card Phone - GSM SIM Slot, Bluetooth Sync, Camera Trigger, 320mAh Battery (Yellow) to your Shopping Cart. It just doesn’t get more minimalistic than this. The iNew Mini 1 is the size of a credit card, an yet brings you all the communicative power you might ever need. Brightly-colored, with a simple ergonomic design and sporting a nice touch keyboard, this mini phone is bursting with efficiency. The iNew Mini is a quad band GSM phone and covers an extensive range of GSM frequencies: 850/900/1800/1900MHz. You will always be able to make and receive calls in any part of the globe – staying well-connected at home and on the road. This mini phone comes with Bluetooth support, ensuring quick and easy communication with other Bluetooth devices – mp3 players, speakers, wearables and more. The iNew Mini 1 is a great option for a secondary phone – when you want to have a smaller gadget to bring along on a trip or simply have handy at all times. This way, you’ll be able to quickly pick up and make calls without reaching for you fancy 5 inch smartphone. The iNew Mini 1 can also add some extra functionality to your primary phone - if you have an Android smartphone, it can act as a remote camera trigger. This compact phone features a MTK6261D processor and comes with 32MB of RAM and 32MB of ROM. It has a 320mAh battery which will give you up to two hours of continuous talk time and 4 hours on standby.